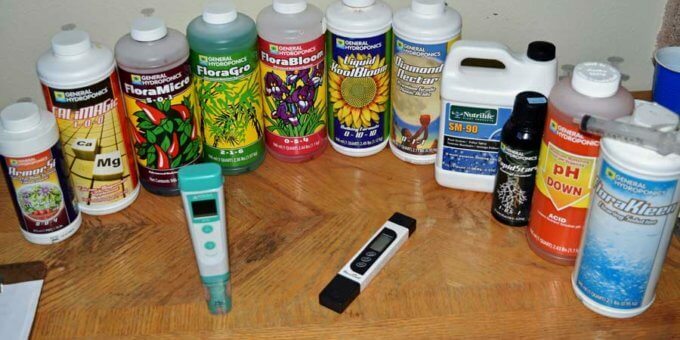 This article is an introduction to cannabis fertilizers, supplements and pH. It is important to understand the role that fertilizers play in plant growth. I start with considering the best way to think about fertilizers and then review the key principles of cannabis nutrient needs. Links to other articles and resources are included to help guide you to becoming a master of cannabis fertilizers and nutrition. Many growers mistakenly think of fertilizer like it is “food” that plants “eat” to grow bigger – This is FALSE. The energy that powers plant growth comes from the light through the leaves, not from nutrients through the roots. During photosynthesis, plants use light along with carbon dioxide and water to make sugars. These sugars are used by the plant to grow and do everything else plants need to do. The only way to give your plant more food is to give it more light. Be sure to look for our article on “Cannabis and Light” Coming Soon. Like all plants, cannabis plants require nitrogen (N), phosphorous (P) and potassium (K), along with numerous micronutrients. However, these are not the “food” that the plant “eats” for energy to grow. Fertilizers are “nutrients” that the plant requires to support healthy growth. Think of them like vitamins. Plants “eat” light and they can do this best when they have the right balance of nutrients. When providing nutrients, the goal is finding the correct balance, NOT giving as much as possible! Cannabis plants require different ratios of the base nutrients throughout their life cycle. They use more N during vegetative growth and more P during flowering. To be able to provide the correct Nutrient Element Ratio (NER), it is important to use nutrients that are designed for cannabis and to follow the feed charts that suppliers provide. There are many conventional and organic options to choose from. 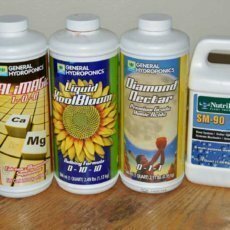 I use the Flora Trio from General Hydroponics. Like many systems, it has three parts: Flora Micro, Flora Gro, and Flora Bloom. The ratios of these that you should use change during the course of the grow. The feed charts that the nutrient supplier provides will allow you to mix nutrient solutions that have the correct NER for each stage of growth. However, if you follow the recipes exactly, you will end up with a nutrient solution that is way too strong as measured by Electrical Conductivity (EC). As I explain in the articles, “Principles of Fertigation”, and “Understanding Osmosis and EC”, fertigation (adding fertilizers to the irrigation water) needs to be a balance. You need to provide nutrients at the correct NER, but you also need to provide water that is not too salty. The saltiness of the water comes from the fertilizers, but the problems it creates do not have to do with plant nutrition. When the water is too salty, plants can still get nutrients, but they can no longer pull in water through osmosis. This leads to the symptoms commonly known as “fertilizer burn” or “nutrient burn”. Always remember that the feed charts allow you to get the right ratio of nutrients. However, you need to measure EC in order to get the correct strength. Be sure to read our tutorial, “How to Mix Nutrient Solutions” to learn how to create solutions with the correct NER and EC. In coco, it is critical to provide additional calcium (Ca) and magnesium (Mg). Cannabis fertilizers include Ca and Mg, which is adequate in other hydroponic media and in soil. However, in coco, there are cation exchange sites that demand additional Ca and Mg. This is such an important issue that we gave it its own article! Be sure to read our article on “Why you need Cal Mag in Coco”. You need to always use coco that has been properly buffered: Most prepared products come pre-buffered, but if you start with brick coco, you need to buffer it yourself. 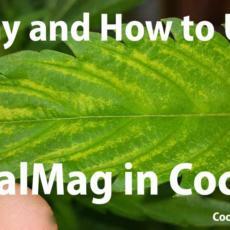 See our Tutorial, “How to Prepare and Buffer Coco Coir”. When Considering Supplements, Consider Their EC Impact: It is important to realize that almost everything that you add to the water raises the Electrical Conductivity (EC). As I explain in “Principles of fertigation”, you should have EC targets that dictate the strength of your nutrient solution. Supplements that have a high impact on EC should be carefully selected and dosed. Supplements also may have a strong impact on the pH of your nutrient solution. The pH of the nutrient solution affects the solubility of the nutrients in the solution. If the pH of the solution that you add is outside of the acceptable range, some nutrients will be unavailable to the plant. 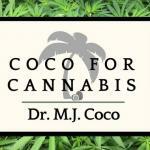 If you are experiencing nutrient deficiencies in your coco grow, pH may be responsible. There are two main causes of nutrient deficiency when using quality cannabis nutrients. Calcium and magnesium deficiencies are almost always caused by unbuffered coco as discussed above. However, most micro-nutrient deficiencies that occur are a result of pH issues. To avoid these issues and ensure that nutrients are available to the plant, it is critical to adjust the pH of the nutrient solution to the appropriate range (5.5-6.5). 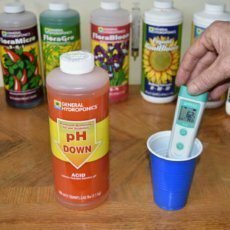 Be sure to read our tutorials on “How to Mix Nutrient Solutions” and “How to Measure and Adjust pH”. 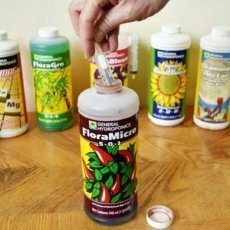 Seeds can make it a week with no fertilizer, but they can start using fertilizer sooner than that if you are careful with doses. I suggest feeding with very dilute nutrient solution starting when the cotyledons (first leaves – rounded) first open. If you follow my seedling recipe, with 2.5ml Cal/Mag, you will get a solution of about 800EC. You want to start with only 400 EC and work gradually up. So dilute it 50/50 for the first watering (after the cotyledons open). I know you are planning to water every third day, so for the second feeding dilute 75/25 (EC of about 600). By the third fertigation, you can give the full strength seedling solution. I definitely measure the pH of the water! Can’t mess with that. And it’s been 2 weeks since they popped out of the dirt and about 4 days before that I planted them. The only nutes I gave so far were some rapid start by grotek at 1/4 STR and then some general organics diamond black and 1/4 STR about a week ago! And nothing else because I saw some nute burn already. But since it’s been 14 days I’ll start giving them some nutes based on the general organics feed schedule!